Perdition is an IMAP/POP proxy written in C, and it offers map user connections to another mail servers where store the email inbox. 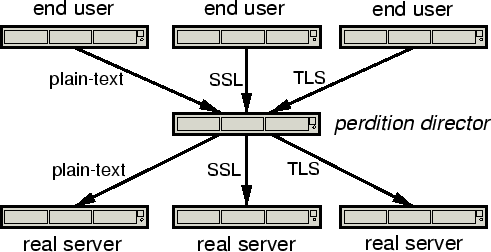 The clients will connect to perdition server and this will distribute the connections to the corresponding server. In this scenario is configured one server mail.mydomain.com with ip 192.168.1.51 running postfix and perdition, this will accept the IMAP4/IMAP4S and POP3/POP3S connections and will redistribute to the mailboxes mbox1 and mbox2 with ip 192.168.0.16 and 192.168.0.17 with another internal network, this process is transparent for the end user and the mail clients will have the same configuration. user: name of user. Up to 128 characters. May not be NULL. servername: name of server for user. Up to 255 characters. May not be NULL. port: port to connect to on server. May be NULL. # Please do not edit the values below. echo "Unable to start POP3 Daemon (maybe another process is listening to the same port?)" echo "Unable to start POP3S Daemon (maybe another process is listening to the same port?)" echo "Unable to start IMAP4 Daemon (maybe another process is listening to the same port?)" echo "Unable to start IMAP4S Daemon (maybe another process is listening to the same port?)" echo "Reloading $NAME configuration files"
This is the only page I could find explaining the entire Perdition setup, THANKS! 10 & 11) Not needed, already done by RPM, except need to modify /etc/sysconfig/perdition to disable managesieve. Also note: there are bugs with the init script related to managesieve, you won’t be able to get status nor stop it until fixed. One of the problems is CentOS/RH only provide 15 characters of the process name in the “pidof” function. The other problem is “status” is looking at imaps instead of managesieve. I didn’t use postfix, so don’t know about any changes related to that. Thanks for your comment!! The OS used in this post I think was Centos 6.0, the directories you mentioned, you can change with –prefix flag in the configure process for compile perdition. Very useful your info, If I’ve to install from rpm packages, I will keep your tips in mind! hi i got the below message..
the predition is using 110.. then not able to start dovecot. any idea ?